Are investors in India spoiled a lot? Does it look like we have enough regulations for the investor to make sure his money is safe or do you think that laws still need to be made to make investing a happy experience? The stock market looks robust and we haven’t seen a major scam for quite sometime now; IRDA and SEBI have and are still sorting out the ULIP mess; SEBI has made Mutual Funds cheap – is there more the investor wants? Sure they do – there is always room for improvement at the top! To assist the regulators, the investor needs to increase his awareness too. Here are my top 3 wish lists for the small investor in the personal finance space which will make investing a memorable experience for him. 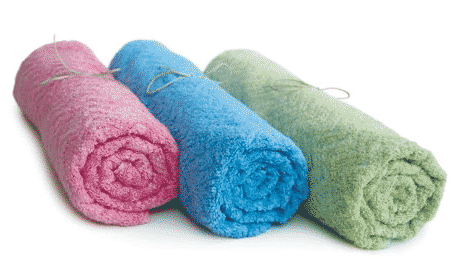 A home is often the most prized possession for the small investor today. But often he finds himself at the receiving end of the deal. The modus operandi is the agent or builder will sweet talk you into booking an apartment after you have shown interest in the project. Once you shell out the booking amount, you are locked in with the builder and the project you bought into. Future demands of money come in; you pay up through a home loan and the builder delays the apartment delivery, in many instances routing your money to launch other projects. A home is the biggest asset the small investor buys in his lifetime( Also see Tips to Buy house). Paying the home loan is a huge burden to begin with. Given this, it is but anybody’s guess what a nightmare he goes through when the real estate builders delay the projects by years – the investor has to pay the rent and pre-EMI together. That is a huge drain on his finances. The regulators ought to come out with a mechanism to stem this rot. Builders need to be rated and penalized for late or shoddy delivery. There needs to be a mechanism in place to penalize builders who cannot deliver the most prized and costly possession for the investor. CRISIL has already come out with its Real Estate Star Ratings in August 2010 – we will have to wait to whether this helps the real estate industry in a positive way or it becomes just another rating mechanism without serving any useful purpose for the buyers. Till that happens, the investor has to suffer and fight the battle himself. The old adage “Insurance is never bought, it is sold” holds true even today. Seldom does one buy insurance for protection purposes; it has been mostly sold as an investment vehicle. And whenever a product is sold, it is commissions that drive the sale, not the investor’s profits. Call it the insurance agent’s smart tactics or the gullible investor’s ignorance, insurance, and especially ULIPs, continues to be mis-sold. This seems to be the most talked about topic in every personal finance corridor. There are regulations to stem the dirt from spreading and there are investor awareness programs out there; the regulators fight and introduce more regulations but at the end of the day, the investor continues to still suffer. Given the history around this, I think no amount of regulation can eradicate this illness. The only answer is investor awareness. If the investor empowers himself with what is best for him, he will buy the best insurance and probably look at money back, endowment plans and ULIPs the last! We need to get to a state where insurance is sold only for what it’s meant to be bought for – protection! It’s a very old saying – “It’s not timing the market that matters, its time in the market that matters most”. Equity is meant for the long-term but most investors buy and sell equity to make profit in the short-term. The investor’s lure is milked high and dry by brokerage houses that earn on brokerage charges which investors generate for them by buying and selling securities. All brokerage houses will bombard you with SMSes and calls about a hot stock tip, in fact, we recently had the same brokerage house giving a buy and sell signal on the same stock on the same day, one to institutional investors and the other to retail investors. More churning and constant buying and selling never made anyone rich except the broker. Look at what the Executive Director and COO of Pramerica Asset Managers was quoted in Money Today as saying. It has been proved that the amount of money that one could generate by active trading is usually less than the amount you could generate by passive investing over a long period of time. IPO’s are issued using the book building process with the idea that the price discovery will happen by buyers but it’s anything but that. Investors still lose money in IPOs. It’s not just insurance that is mis-sold, its equities too ! As a nation bursting at it seems with a young population, the regulators, investors and product sellers need to make sure that investors can have the confidence in investing in products that suit their over all portfolio – its only then that we can pass on the baton of confident investing to the next generation. This is a guest post from TheWealthWisher, a personal finance blogger and financial planner. 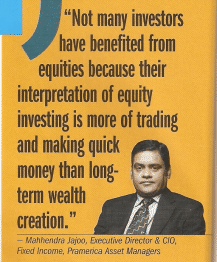 Only by having a long term view in equity investing one can make money! Patience pays fruitful returns. Exactly, I wish regulators should spare some thought for real estate investment. That is where big fraud takes place. Right from the sales agent to builder everyone is hell bent on cheating. It does needs reform and stringent norms. Big problem is those who can make rules and those who manipulate them are on the same side of the table. SS agree with you . Protection through insurance is all the more essential for the millions of BPL people in the unorganized sector. Can we think of of simple term insurance model, where tiny contributions by the individuals, supplimented by some Govt. assistance, will bring in a reasonable insurance coverage for such people. It has to work similar to the ‘micro finance’ model. Why the insurance companies can not think of these business models and increase their business instead of milking a relatively small popolation of middle class people through the notorious ULIPs? Great thought ! . I agree with you , instead of targetting just 10 crores of population , why not target 100 crores . I am sure there has to be some blocking point on this, else they must have thought about it. Can you see why its not happened yet ? life insurance is needed for everyone who has a financial dependent.. but we all need medical insurance much more than that. More people are pushed to poverty due to medical illnesses than for any other reason. So i feel that if a mass micro insurance product is needed for BPL families, it must have a medical cover. If you do the math, you will see that out of 1000 people in a year, many more people will fall ill than die. I think first step have to take by IRDA that all insurance agent does not have minimum or target to continue their lic. on sub year. Because maximum LIC or other insurance Agent doing or done by him due to indirect pressure of company to continue their job or licence. i think this step will make all advisor in comfortable zone. so can do proper advising about insurance, saving, investment. Yes , a lot of mis-selling is result of pressure from company on agents . a) all charges from ULIP like premium allocation charges & policy admin charges should be removed. The mortality charges should in ULIP should be at par with term insurance charges. The commission to agent can be paid as a % of fund value like in mutual funds. Initially, it will be less. But as the fund grows, both – the customers & the agent will be profitable. In this way, agent will concentrate on customer’s fund value instead of initial commission. b) The Govt. should make all annuities, maturity amount / partial withdrawal from pension plans tax-free. This will give BIG relief to senior citizens. After all, they’ve paid income-tax before investing. Now, they should enjoy tax-free life. Isn’t #2 is more for agents to worry about then investors? #3 I think direct equity is unsuitable for most people who cannot research stocks. Selecting well managed mutual funds is a better option. #2 I was surprised to hear my agent say that Amulya Jeevn (LIC term policy) is more lucrative for him than LIC ULIPs! He pushes for ULIPs because the public wants some kind of money-back scheme rather than pure insurance! 1. He is really honest one and wants to sell pure term policies , there are many agents like this who want to be in right direction , but the way industry is formed does not allow them to . could you ask the agent if LIC pays a bigger commission for term insurance than ULIP for the SAME premium? The reason this is important is that term insurance premium tends to be much lower than the ULIP premium for the same assured. So even if the % commission is the same (say, 20%), the amount would be bigger for ULIP. Even if the commission RATE for Term insurance is higher, the commission AMOUNT may be lower . Yes he says he gets more commission in term policies. He gifted my newborn Rs. 500 the day my Term policy was confirmed! I assume he must have said for comparable premiums. He was keen on Jeevan Anand. Maybe he gets more there! Hi manish.. nice article.. infact nice site & very good blogs..
As you made a point most of the indian populaiton is going & more youngsters are in the line coming ahead.. I would like you to write a blog intended directly to these youngsters.. like i am 24.. unmarried. earning my 2pens & saving most of it as have less outgoes.. So how & where to invest. you can take an example of a typical 24 yrs old & explain different stages of life for him. I think that would me gr8. We(stupid engineers no commercities:P) will get good knowledge on personal finance & you will fetch you more readers..
PS;Btw i always click on your advertisings to increase your count. PPS: lot of spelling mistakes. Bear oops.. beer.. double oops.. bare with me. Young generations, Just cant write proper english. Adictd 2 txt lnguge..
Nice article. 3rd one is obsoletely true. Yes , Almost all are true , but in my opinion #2 one is the most needed right now as it affects every one from poor to middle class to rich . What do you say ? I think IRDA should make the agent commission a % of the sum assured rather than premium amount. This will ensure that people will be adequately insured. How will it change ? If you make % of SA , then how much % will they make , even if its 1% , its a big numer 🙂 . what are your thoughts on that ? it won’t be 1%. It will be a much lower %. But since the sum assured is a high amount, the income will not change much. What this change will achieve is this. The agents will no longer be interested in pushing up the premium. Rather they would be interested in making sure that the policy holder is well protected. (Of course there is an upper limit on the sum assured depending on the person’s income). Know the reason this would never happen? The insurance companies don’t want to help people either. They want more and more asset under management. So why would they want higher sum assured (which would push up sales of term insurance). They would rather sell ULIPs which give the huge asset under management with a small life cover liability. To an extent yes , but wont agent then try to pursuade clients to take higher sum assured Insurance , even though they dont need it ? yes.. that’s why it’s a good thing.. people will be adequately protected. Unlike the current situation when most people are grossly under-insured. Anyway, there’s an upper limit on sum assured. Most insurance companies limit it to 10 or 12 times the annual income. Any more of sum assured creates a “moral hazard” for the company and hence is not allowed. So if this new scheme ever becomes a reality (which i doubt ever will), this upper limit will still apply.